Like many things involving guns, Hollywood has made carrying a gun on your ankle look “cool”, which is why I hear a lot of new shooters wanting to give this carry method a try. But the fact is, there’s a lot to know about carrying a gun on your ankle and I don’t recommend it for most people. First, let me start with the ultra-simple. If you are a right-handed person, you wear the gun on the inside of your left ankle. This allows you to reach down with your right hand and easily draw the gun. Second, when you are drawing the gun you need to bend slightly at the knees. With your support hand you need to pull up your pant leg so that your shooting hand can access the gun. This is obviously something you want to practice. If you decide that ankle carry is right for you, you would want to spend 10 minutes, 2-3 times a week practicing your ankle draw with a safe and empty weapon. Third, ankle carry is never as comfortable as everyone says it is. It’s not horrible and you will quickly get used to it. But, if you’re the type of person that wants to carry a gun with as little discomfort as possible then you’ll probably want to go with pocket carry or outside the waistband carry. Fourth, consider the calf-retention strap. 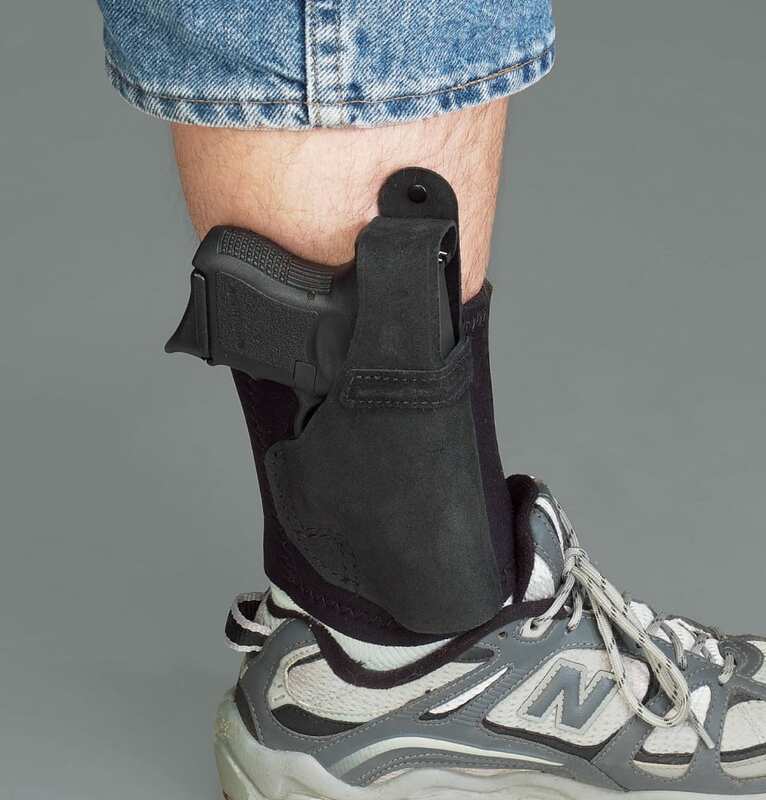 The truth is, unless you want to wrap the holster so tightly around your ankle that you cut off the blood flow to your foot, you’ll likely want to get a calf-retention strap. Fifth, the reason I don’t recommend ankle carry for most people is because it takes longer to draw the gun. Drawing from your pocket, or inside or outside the waistband is much quicker since you don’t have to bend over to access the gun. I don’t have to tell you that in a life or death situation every second counts. In fact, the only situation that ankle carry is really worth it is when you’re driving. So, if you take a lot of long road trips this type of carry may be for you. If you do decide to go with ankle carry remember that you want to carry a small and lightweight gun. If you try and carry a Glock 17 on your ankle then you’ll instantly hate it and think ankle carry is the worst thing ever. The gun I use for ankle carry is a Ruger LCP and I use the Galco Ankle Lite holster. I’ve tried several other ankle holsters but this is the most comfortable one I’ve found. If you get this holster (or any other) just remember that at first it will be tight and you’ll have to shove the gun in it and leave it in there for a day or two to break it in.